GREEN BAY, Wisc. — A Wisconsin teacher has resigned from her job in providing emotional testimony about the increasingly out-of-control violent and sexually harassing behavior of students, which she believes is a threat to the safety of both students and staff. 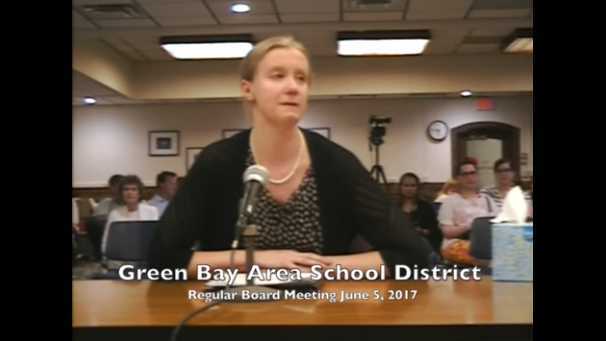 “I must resign even though I have a broken heart, because I cannot survive in this unhealthy and unsafe environment any longer,” Washington Middle School sixth grade teacher Kerstin Westcott told the Green Bay School Board on June 5. Wescott, who has worked as a teacher for twelve years—nine of them at the middle school—and is a Golden Apple Award recipient, says she has watched student behavior increasingly worsen over the past five years, and especially this past school year. She said that teachers are daily cursed at and called “vile, crude and sexual names.” She offered copies of a page-long list of remarks that students had made in just the last two days. Wescott noted that some teachers have been injured trying to break up physical fights, including one teacher who was taken away in an ambulance just two weeks prior. “Another teacher was physically attacked by students trying to set off a deadly allergic reaction on purpose, causing her throat to close and her to struggle to breathe,” she mourned. Wescott outlined that she had instructed her students not to answer the classroom door because some truant children walk the halls looking for fights. “They pound on our doors, shake our door handles, scream swear words into our vents, punch and kick the doors, and terrorize us while we try to teach and learn,” she explained. Wescott also said there have been numerous instances of sexual harassment of students by their peers, and recounted a recent incident where a student flagrantly exposed himself in front of staff members and then laughed at the teachers’ reactions. Some students, the teacher outlined, are selling drugs or bringing weapons onto the premises, and some have started fires or threatened other violence. Wescott said that while the increased presence of school authorities have helped curb the chaos, it is insufficient, and urged administrators to take drastic action. She noted that because of the ongoing out-of-control behavior of students, the work environment is so “toxic” that it is literally making teachers sick, and some are on medication to cope. View Wescott’s emotional testimony in full below. Last week, Superintendent Dr. Michelle Langenfeld issued a statement to ensure the community that safety is a priority for the school district and that Wescott’s concerns were taken seriously. Langenfeld said that efforts had been underway to address student behavior, and that further action will be implemented. She said that she had been told by other teachers that recent administrative efforts helped to improve the learning environment.